I was on the me.tv website recently looking for the schedule and came across some '66 bat quizzes that I think you guys will enjoy! 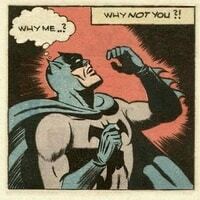 Is the scene from batman or the wild Wild West? Did these popular villains ever appear on batman? Can you name the batman villains based on these emojis? Can you match the henchmen to the arch villain? "Holy Batcademics! Are you sure you didn't use the Batcomputer for help?"